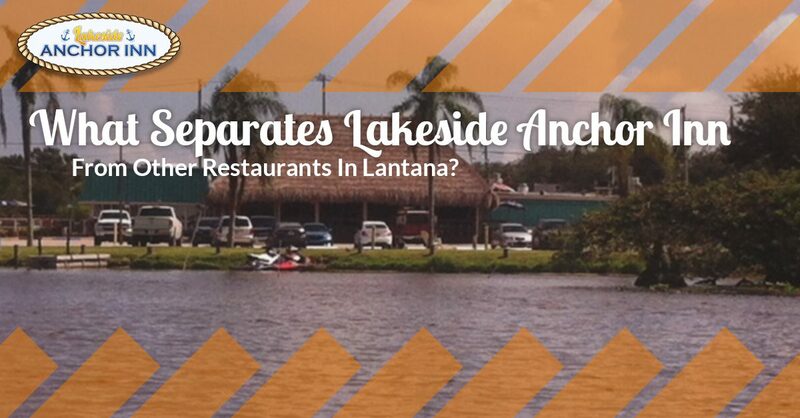 Seafood Restaurant Lantana: What Makes Lakeside Anchor Inn Different? Whether you’re decompressing from a stressful day at work or you’re looking to kill a few hours and check out the big game on a lazy Sunday afternoon, we want you to know that Lakeside Anchor Inn is here for you. We’re proud to have well-established roots here in the Lantana area, serving customers coming from the nearby communities of Hypoluxo Village, Boynton Beach, Lake Worth, and even all the way up from West Palm Beach. Each and every day, it’s an honor to serve our customers and develop rich relationships with regulars like you. We always keep it fun at Lakeside Anchor Inn, and we’re incredibly excited for the future and what 2019 will bring for our laid back restaurant on the water in Lantana. In a poorly veiled attempt to toot our own horns, let’s look at some of the key aspects of our waterfront seafood restaurant that separate us from the competition. Lakeside Anchor Inn is not just a restaurant. Though we offer a full menu (and we’re open late, too! ), we are also proud to host weekly events that bring the community together for fun and games. From DJs and live bands to football viewing parties and even poker nights, there’s always something exciting going on. While our tiki bar — a favorite of many of our regulars — offers a rowdy-friendly environment ideal for loud football cheers and clashing beers, Lakeside Anchor Inn also prides ourselves on offering family-friendly seating inside of our restaurant. Ideal for couples looking for a quiet meal or just for families who wish to be separated from the rowdy crowd, we offer two completely different atmospheres that cater to everyone. It’s hard to beat a waterfront drink while you’re waiting for your food, and there’s no better compliment to watching a football game while clutching a beer. Where else can you get a five dollar double no matter what time of day it is? From two dollar beers to a variety of weekly drink specials, consider every hour a happy one when you’re sitting in our tiki bar. At Lakeside Anchor Inn, seafood is just the start (seriously — we recommend starting with our raw oyster bar). We’re also proud to offer a variety of made-to-order sandwiches, salads, wraps, quesadillas, wings, pizza, soups, sides, entrees, appetizers, and desserts to satisfy just about any hunger craving. It’s true that seafood is our specialty (we’re near the ocean after all, right? ), but we don’t feel that it’s appropriate to limit our menu like that. No matter what you’re in the mood for, our comprehensive menu is eager to please. Come On Down And Visit Us Tonight! Life isn’t moving any slower, and you’re not getting any younger. Why not take advantage of the present — life’s greatest gift — and head on down to our seafood restaurant and tiki bar in Lantana? Get in touch with us today!